Bakers have always characterised dough by hand kneading and stretching to assess its quality, and know that baking performance is related to these rheological properties. 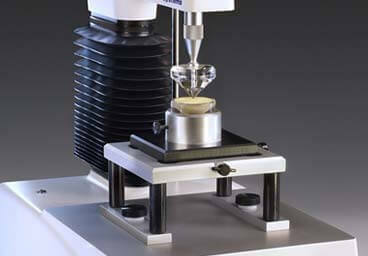 Such a simple test indicates the type of measurements that are required to predict baking performance. Bread making is a complex process involving mixing, dividing, moulding, sheeting, proofing to final baking, each of which have a characteristic time scale, strain and strain rate. As the rheological behaviour of dough is non-linear with strain, measurements must be made under conditions of strain and strain rate similar to those encountered in baking. 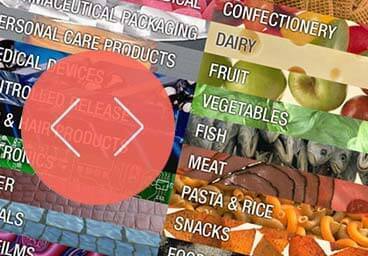 The software provides users of the TA.XTplus or TA.HDplus Texture Analyser, in conjunction with the D/R Dough Inflation System, with real-time graphical display, and analysis of the test. 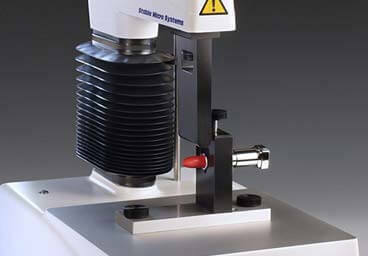 Tools are provided to make measurements, such as drum distance, pressure ratios, areas, volume change and deformation energy between two points as well as simple spot values. The software has built in macro and spreadsheet facilities to aid automated data collection and analysis. The spreadsheets support a range of mathematical functions that enable results to be derived from the basic data. Charts are easily created to present spreadsheet results in a more convenient format. 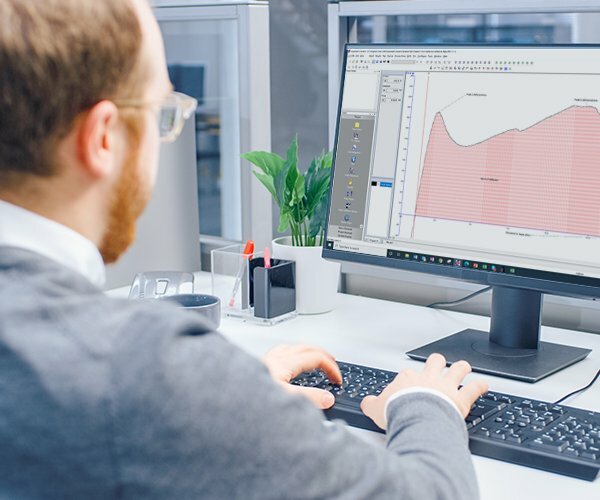 Graphs, Charts and Spreadsheet data are all compatible with other Windows™ applications via the clipboard to create sophisticated presentations with other programs. 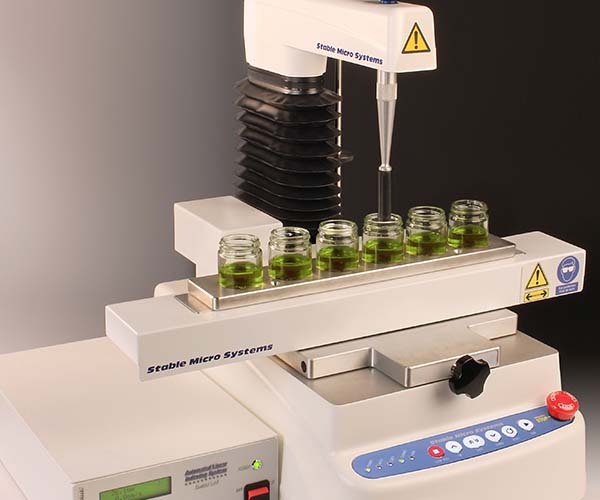 Allows equivalent test methods and results obtained from traditional inflation equipment with the benefit of total test settings and data analysis flexibility for alternative rheological assessment. For example, stress relaxation measurements can be obtained by inflating dough to a fixed volume and measuring collapse in stress with time. The ability to inflate dough up to temperatures of 60°C can been incorporated by the addition of a customised temperature chamber. 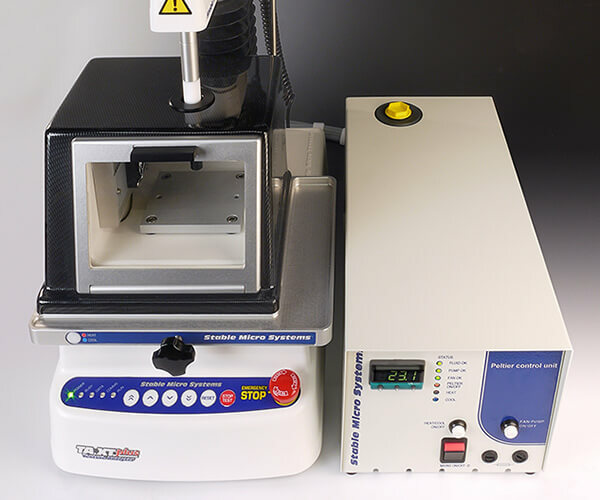 This not only provides the desired inflation temperature for dough but also houses samples during their pre-test equilibration period. 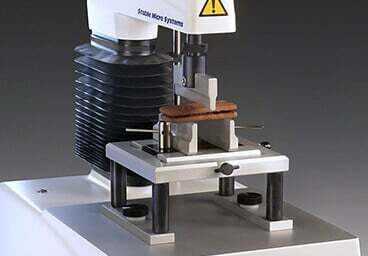 Measurements of dough extensional properties are important in predicting baking performance. Minimum dough handing integrity of results. 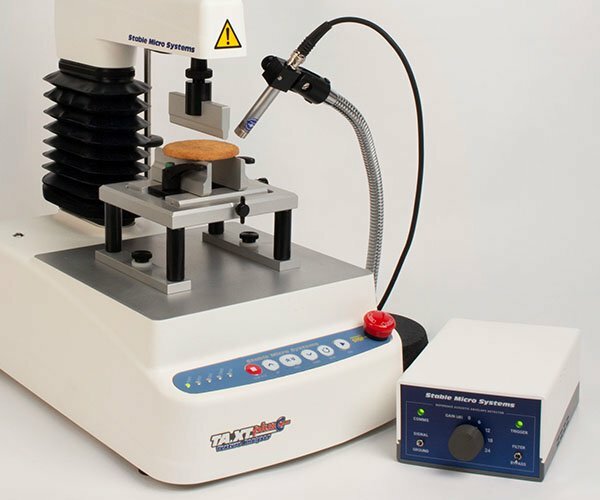 Provides a rapid test method to measure gluten quality based on its extensional properties. 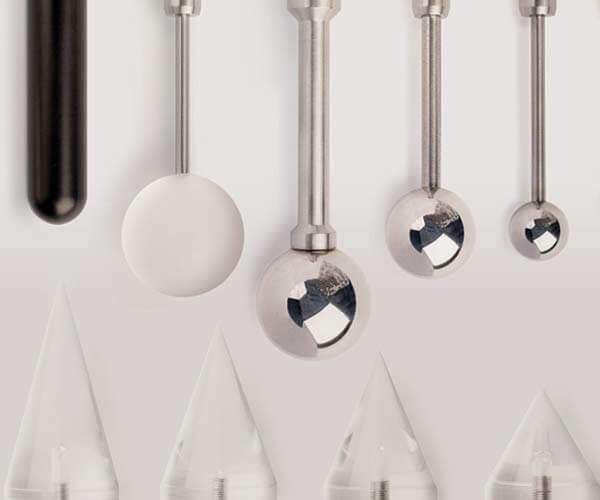 In the process of design modification the ability to inflate dough up to temperatures of 60°C has been incorporated by the addition of a customised temperature chamber. 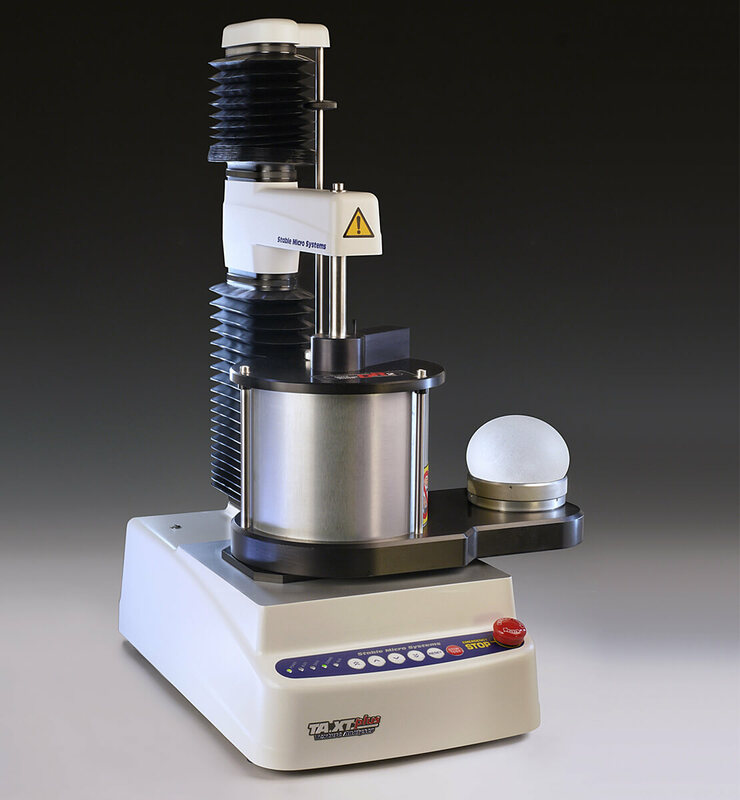 This not only provides the desired inflation temperature for dough but also houses samples during their pre-test equilibration period. 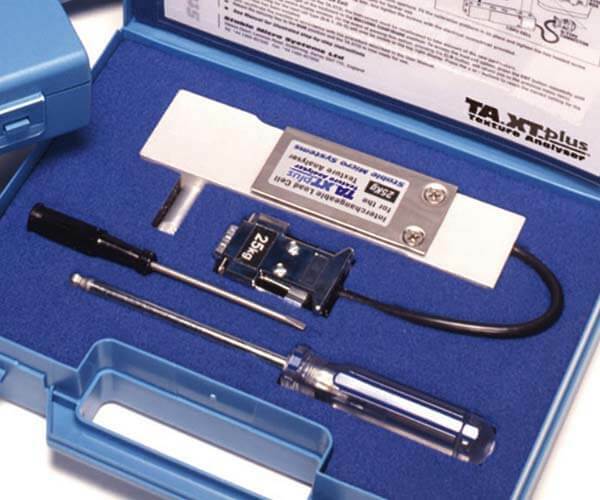 The TA.XTplus texture analyser has the unique option of continuously variable inflation speed, which allows tests to be performed at constant strain rates. 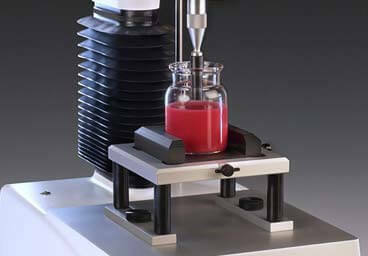 Because dough is viscoelastic, its rheological properties vary with both strain and strain rate. Therefore it is necessary to separate out the effects of strain and strain rate by keeping one constant whilst varying the other. 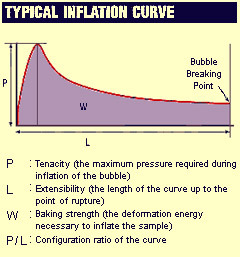 As an option we provide a dough inflation test sequence where strain is varied and measured as the bubble inflates, and by continuously changing the speed at which the bubble is inflated, strain rate is kept constant. Work at Reading University as part of a MAFF funded LINK project has shown that the stability of failure in single dough bubble walls is related directly to the extensional strain hardening properties of the dough, and that strain hardening plays an important role in the stabilisation of bubble walls during baking. 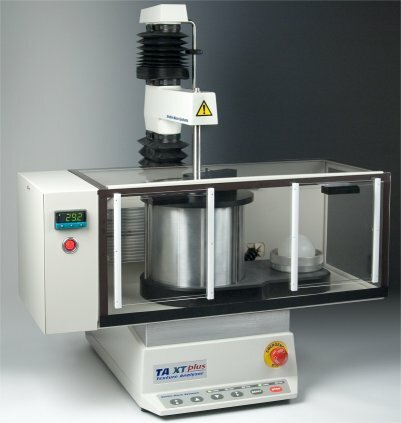 Strain hardening measured at 50°C and constant strain rate for a number of commercial flours of varying quality using the TA.XTplus has been related to commercial breadmaking performance.